Sicklerville residents Steve Coddington and Michele Asher are part of the Special Olympics team. They improved their skills and had fun during this unique experience with the collegiate team. 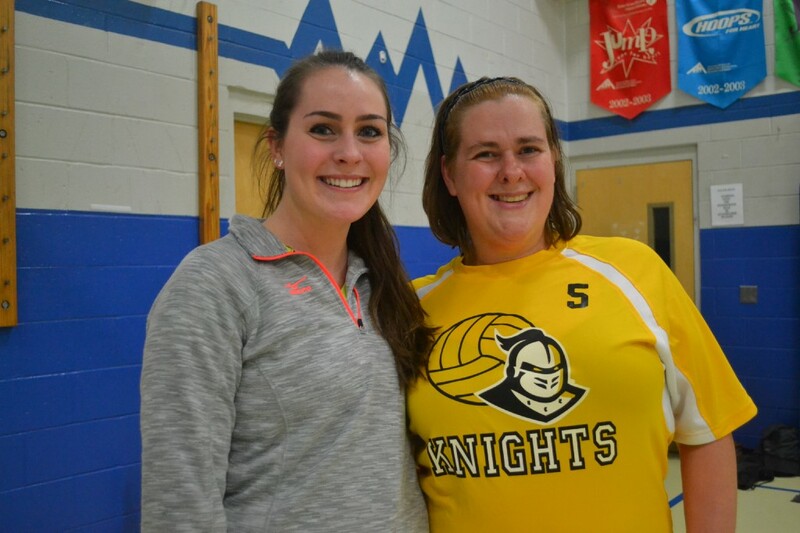 Neumann University girls volleyball player Bianca Harbold, left, and Special Olympics athlete Michele Asher are all smiles during their practice. With a volleyball in his hand, Steve Coddington couldn’t wipe the smile from his face. He threw the ball up to serve over the net, and cheers from his teammates ensued. The Sicklerville resident loves being part of the Special Olympics volleyball team and the camaraderie that comes with it. Most of all, he has fun every second he’s on the court. At a recent practice in December, him and his teammates had a treat — the Neumann University girls volleyball team came to practice with them. Little did they know before they walked into the Copley Hall gymnasium at Bancroft’s campus in Haddonfield how many similarities they all had. Both teams’ names are the Knights and both teams’ color is yellow. They bonded right away over the resemblances and because of everyone’s love for volleyball. The Special Olympics volleyball team practices every Tuesday night and consists of athletes of all ages with intellectual disabilities from South Jersey. Jeanne Bozicek, life enrichment manager at Bancroft, coordinates the adult Special Olympics. “We try to do unified teams as much as possible, where people with disabilities play on the same team with people without disabilities, and so we believe if we play together, we will also work together and live together,” she said. Some of the members are Bancroft residents and others are from the community who have disabilities and don’t receive services from Bancroft. “They are part of the community, and our residents are having even more friendships and relationships,” Bozicek explained. Relationships formed between the two teams as they practiced serves, how to handle the ball and how to block the ball. Coddington’s wife, Michele Asher, was happy everyone was there to do the same thing and have a good time, which is what the entire night was primarily about. Special Olympics coach Rachel Farreny could tell right away it meant a lot to her players to play side by side with collegiate athletes. “The social aspect was great for them and you could see in their faces just how much fun they were actually having and when it comes to sports and competition, that’s what matters the most,” she said. Neumann girls volleyball coach Alicia MacGlaughlin said the practice brought a “different light on the game” for everyone involved. “I think for the coaches and for the players, it brings a different appreciation for a game that we play,” she said. While Coddington has so much fun playing volleyball, he not only plays the game for himself, but for his daughters, too, so they can look up to him and his wife. Their 10-year-old daughter also plays in the Special Olympics, and their 7-year-old daughter will be eligible to play when she turns eight.